She was rushing as she didn't want to miss her carpool to school. "I have be on time for my exam". While hurrying down the stairs, she tripped and fell. "Mama! I have twisted my ankle and can't move my foot!" "Never mind. You take rest today. All will be well. We'll visit the doctor", her mother assured. "But, you can't even walk with your sprained foot... By now your car must have left. And even if I leave you by alternate transport, you can't possibly walk up to your classroom that's on the third floor of your school." Bearing the throbbing pain, she knew that her mother was right. She woke up with a bad cold and her continous sneezing demanded that she should take a sick-leave. He overslept as his alarm didn't ring or perhaps he didn't hear the alarm ring. She had started when she remembered something she had forgotten and had to head back home. He took extra time tying the shoe-laces that day. Her child was bawling and just wouldn't leave her. He chatted extra time with an acquaintance and got late. She was just locking the door when there was a phone-call on her landline that she decided to answer. He saw his elderly neighbour with many shopping-bags and feeling responsible to help him, he accompanied him back home. She was waiting for her office-transport, when a car splashed muddy-water on her dress and she had to head back home to change. He was on his way to job-interview, when he saw an accident-victim and went to the nearest hospital. She just couldn't locate her mobile-phone and spent precious minutes looking for it. They were getting late for their presentation/train/flight, but were stuck in a bad traffic-jam. All the above persons got late for office/appointment/interview or missed their transport. All the above persons deviated from their usual routines and couldn't keep their schedules. All the above persons felt helpless and then had to adjust to the situation that life had presented them. All the above persons are alive today and whatever happened to them that day was a blessing in disguise. Do you believe that "Everything happens for a reason"? How do you react when things don't go your way? Do you feel that "Everything happens for our own good"? The other side. 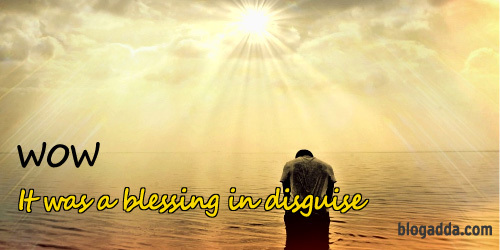 A lot of blessings do come in disguise. I've been hearing similar stories now -- after the Vegas mass shooting. Sometimes we forget that everything happens for good. We get tensed or we get upset. But, later, the 'Kaal' shows that everything is already planned and it is for good. Such true motivating stories reassure that even if things don't happen as we wished, we can always look for the best from the situations we face. I can feel positive vibes surrounding me! Thank you! Quite often events, though unpleasant at first, turn out to have happened to save us. Very well written Anita. Blessings do come in disguise. Blessings often do come in disguise. Mind-blowing, sensitive and compassionate writing. Everything happens for a reason and wonderfully executed with words.